These birds are called dippers because of the way they dip or bow when they become agitated, mate, or defend territory. They also blink their eyes rapidly, displaying their white eyelids. Dippers are unique because they spend most of their lives in water, often submerged, searching for food. Their waterproof feathers and the swimming motions of their rounded wings allow them to stay underwater. Their feet often grasp pebbles to anchor them to the river bottom. They will dive into water to escape predators. The songs of both sexes, sharp "zit-zit" sounds, can be heard over the roar of rushing water. Generally, dippers mate for life and either remain in a familiar nesting area or return to it yearly. Their nests are rounded with a wide entrance in the side. Both sexes build the outer nest with moss, grasses, and leaves, but the female creates the interior of softer grasses. Because the nests are build near water, the exteriors are usually moist and may stay green. Dippers can have two broods, or groups of offspring, hatch at the same time each year. They usually lay two white eggs in the tropics and as many as seven in other climates. 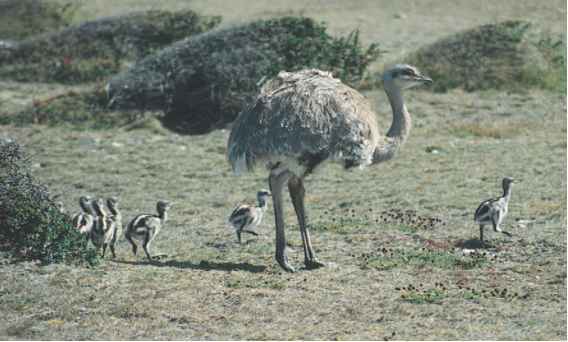 Females incubate their eggs, keep them warm for hatching, for sixteen days. They are then fed by both parents for up to twenty-two days.